The relative rates of growth in the supply and demand for food, feed and fiber have far-reaching economic and social consequences, most readily observed through changes in commodity prices. Over the past 50 years and longer, the supply of food commodities has grown faster than the demand, in spite of increasing population and rising per capita incomes. As a consequence, the real (deflated) prices of food commodities have trended down over many years, contributing significantly to the alleviation of hunger and poverty worldwide. 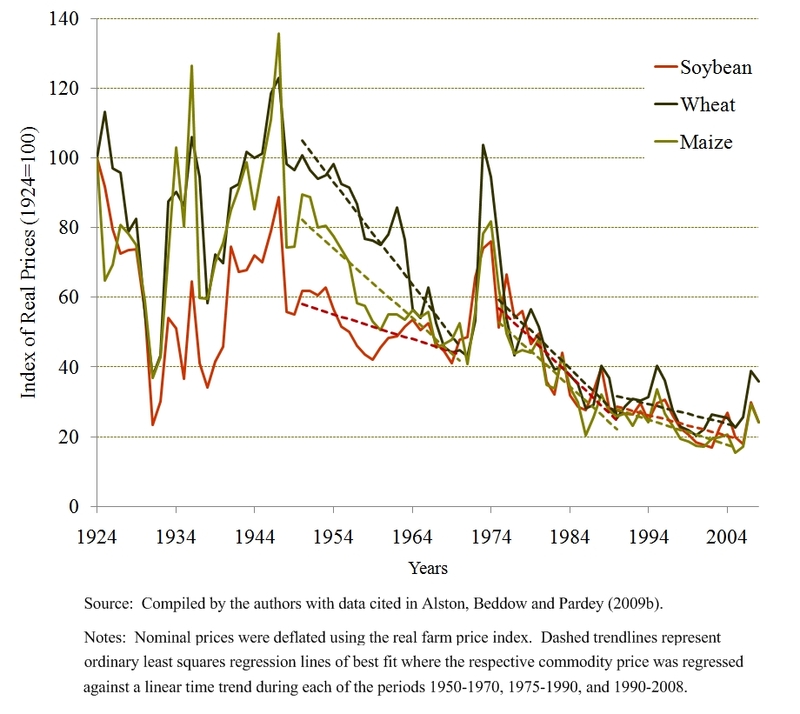 Figure 1 illustrates the long-term trends in global commodity prices, using U.S. price indexes for wheat, maize, and soybeans over the period 1924 to 2008, expressed in real terms by deflating with the index of prices paid by farmers. These indexes all start at 100 in the base year of 1924. While rice was omitted to improve the clarity of the plots, rice prices follow a similar overall pattern to the commodity prices shown here. These price patterns reflect the fact that supply has been growing faster than global demand generally, albeit at different rates for the different products. In real terms, commodity prices trended up generally, albeit with some major fluctuations during and after the Great Depression, from 1929 through the end of World War II after which they have trended generally down. This downward trend was interrupted by the major price spike in the 1970s and again at the end of the series by the latest price spike. The trend lines in the figure show the real prices declining at different rates during the period 1950-1970, as they converged towards equality. Then following the 1970s price spike, over the period 1975-2005, they trended down at roughly equal rates. The period since World War II includes three distinct sub-periods. First, over the 20 years 1950-1970, wheat prices declined fairly rapidly, while prices for rice, maize, and soybeans declined at a slower rate. Next, following the price spike of the early 1970s, over the years 1975-1990, real prices for all four commodities declined relatively rapidly. Finally, over the years 1990-2005, the rate of price decline slowed for all four commodities, especially towards the end of that period. Recent turbulence in food commodity markets garnered attention in the popular press. Policymakers and others have been reminded that ever-declining food prices are not guaranteed and that food prices influence the welfare of many people in the world, with rising prices having disproportionately adverse consequences for the world’s poorest and most vulnerable people. Beginning in early 2008, food and commodity prices soared globally and the dismal tally of hungry people in the world increased. Driven in part by the demand for biofuels, stimulated by high and rising oil prices and government responses to them, as well as tight inventories, prices of staple commodities also rose rapidly to historical highs (at least in nominal terms) in early 2008. The peak was short-lived. By November 2008 the price of oil had fallen back to around $50 from an all-time high of almost $145 per barrel in July 2008. Crop production has increased and prices of staple food and feed commodities have also fallen significantly. Still, the experience of 2008 raised questions about the long-term future prospects for food prices. The demand side of the question is relatively straightforward and uncontroversial. Global population is projected to increase by 2.3 billion people, about one-third, to 9.1 billion people by 2050. The FAO recently estimated that demand for food would increase by 70% by 2050, reflecting the effects of both population growth and rising per capita incomes. The supply side is less straightforward. The past growth in supply reflects the increased use of some inputs—especially land, water, and chemical inputs including fuels, fertilizers, and pesticides—balanced partly by labor savings in many places, combined with technology-driven increases in productivity. While increases in inputs were important in many places, agricultural productivity growth was the key driver of the extraordinary growth in agricultural supply in the 20th century that enabled the world to feed many more people, better and at lower cost to the natural resource base than would have been necessary otherwise. With increasing environmental and urban competition for land and water resources, an even greater share of future growth in agricultural supply will have to come from growth in productivity. Will the next 50 years mirror the pattern of the past 50 years, or is the era of ever-increasing agricultural abundance coming to an end? The answer turns on the future path of agricultural productivity. The papers collected under this Choices theme explore recent past patterns in agricultural productivity growth in different parts of the world, with particular attention to the United States (James et al. ), China (Rozelle et al. ), and a set of countries comprising the former Soviet Union (or FSU) and Eastern Europe (Swinnen et al.) buttressed with an overview of global patterns (Beddow et al.). These papers are all drawn from a more comprehensive analysis reported in greater detail in the book on the same subject, edited by Alston, Babcock, and Pardey (2010). Such a review of the recent past is a useful first step towards answering questions about the likely future path of agricultural productivity and what may be implied for the availability and price of food over the coming decades. The papers reveal several interesting points. First, institutional changes in China, the FSU and Eastern Europe during the 1990s have had substantial impacts on global productivity patterns. China has had continuing high rates of productivity growth, pulling the global average up, while the countries of the FSU and Eastern Europe have had a dismal record of productivity, especially during the initial years of transition, pulling the global average down. The effects of these essentially one-shot, institutional changes might have realized much of their supply stimulating effects, so it is not straightforward to extrapolate from the recent past to the future. Second, among developed countries generally, agricultural productivity growth appears to have slowed significantly during the most recent 10-20 years, possibly reflecting an earlier slowdown in growth of spending on certain types of productivity enhancing agricultural R&D. If they are sustained for more than a few years, these diverging patterns of productivity growth can be expected to have very significant implications for international competitiveness and comparative advantage in agriculture among nations, and among regions of the world. The long-term outcomes will turn on the influences of determinants of productivity patterns that cannot be controlled in the near term, such as climate change, and other determinants that can, such as private and public investments in agricultural science and technology. Alston, J.M., M.A. Andersen, J.S. James, and P.G. Pardey. (2010)Persistence Pays: U.S. Agricultural Productivity Growth and the Benefits from Public R&D Spending. New York: Springer, (in press). Alston, J.M., B. A. Babcock and P.G. Pardey, eds. (2010). Shifting Patterns of Agricultural Production and Productivity Worldwide. CARD-MATRIC Electronic Book. Ames, IA: Center for Agricultural and Rural Development, (forthcoming). Alston, J.M., J.M. Beddow, and P.G. Pardey. (2009a, September). 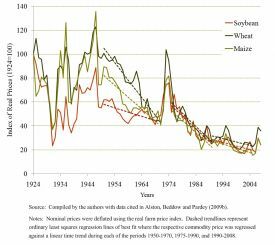 Agricultural Research, Productivity, and Food Prices in the Long Run. Science 325(4), 1209-1210. Alston, J.M., J.M. Beddow, and P.G. Pardey. (2009b, revised September) Mendel versus Malthus: Research Productivity and Food Prices in the Long Run. Department of Applied Economics Staff Paper No. P09-01, St Paul, University of Minnesota. FAO (Food and Agriculture Organization of the United Nations). (2008, September). Hunger on the Rise: Soaring Prices Add 75 Million People to Global Hunger Rolls. FAO Briefing Paper Rome: FAO. Available at http://www.fao.org/newsroom/common/ecg/1000923/en/hungerfigs.pdf. Accessed November 2008c. FAO (Food and Agriculture Organization of the United Nations). (2009). 2050: A Third More Mouths to Feed. Available at http://www.fao.org/news/story/en/item/35571/icode/. Pardey, P.G., J.M. Alston, and R.R. Piggott, eds. (2006). Agricultural R&D in the Developing World: Too Little, Too Late? Washington D.C.: International Food Policy Research Institute. Von Braun, J. (2007, December). The World Food Situation: New Driving Forces and Required Action. IFPRI Food Policy Report. Washington D.C.: International Food Policy Research Institute. Julian M. Alston (julian@primal.ucdavis.edu) is a Professor in the Department of Agricultural and Resource Economics, University of California, Davis and Associate Director, Science and Technology, at the University of California Agricultural Issues Center. Philip G. Pardey (ppardey@umn.edu) is a Professor in the Department of Applied Economics, University of Minnesota and Director of the International Science and Technology Practice and Policy center (InSTePP). The work for this project was partly supported by the University of California; the University of Minnesota; the Giannini Foundation of Agricultural Economics; the Bill and Melinda Gates Foundation, and the USDA�s Economic Research Service, Agricultural Research Service, and CSREES National Research Initiative.